The learning environment at Mott Hall Bridges Academy has evolved over the years, as a result of listening to our scholars and recognizing what they need to thrive as we prepare them for the 4th Industrial Revolution. While leadership requires making decisions based on data, at the heart of education is getting to know children beyond the numbers, having a vision for the future, and maintaining standards of excellence that not only empowers, but inspires. Below are the six things my scholars have taught me over the years. 1. There is no limit to where are children can go, just as long as you are willing to show them what is possible. I remember the first time we took the scholars to Harvard, many of them never thought considered college to be an option because few have family members who have graduated high school. The experience of going to one of the most prestigious universities in the world and having the opportunity of participating in a class, made them realize that they intelligent and capable of making college an option for their future. 2. Every educator needs to know that teaching requires more than just knowing your content and standards, its about becoming a life long learners who is willing to learn best practices, collaborate, network, and have the humility to know it is okay to ask for help. 3. Taking a holistic approach to understand the needs of children in order to meet them where they are academically and social emotionally is essential to effective teaching. This requires active listening, being present, and a willingness to be open to not only giving feedback, but receiving it from our scholars as well. Children are honest about what they learn and how they learn best, they just need to be asked. 4. Your words have power, therefore we as adults must be intentional with how we use them to inspire and build confidence in our scholars, especially when dealing with those who are marginalized in society. I make sure that we create a safe community that is inclusive of children from various races, religions, ethnicities, gender and sexual identity. I call my students scholars as reminder that they are lifelong learners to encourage them to continue to gain knowledge beyond our school building. I refer to them as Brownsville Brilliance, because they represent the beauty and resilience of the community they live in that is referred to as the poorest and violent neighborhood in New York City. But most importantly I tell them that I love them and always want them to know that they matter, because they are worthy and deserve to know that they have a place in this world. 5. Maintaining high standards is not just about demanding the best of others, but being the example as well. My scholars are required to wear uniforms every single day and since opening Mott Hall Bridges Academy, I have worn the royal colors of Black and Purple for the past eight years. How I speak to my scholars, is how I demand to be spoken to as well as every adult in my building. When it comes to supporting my team, I make sure to be present in the classroom throughout the day to give feedback, help in the planning of lessons, or provide best strategies to improve instruction. 6. Never underestimate a child’s potential based on standardized testing. My scholars enter 6th grade on a kindergarten to third grade level reading and math level, because of the poor quality or lack access to early childhood education, or special needs that go undiagnosed for years. But they are gifted in different ways. 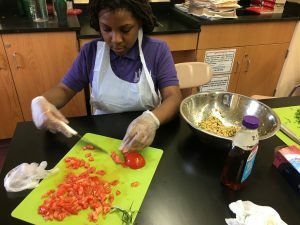 The scholars who struggle academically are talented when it comes to course such as coding, culinary arts, robotics, fashion design, jewelry making, and music production. They are brutally honest, reflective, compassionate, and curious about solving the world’s problems to make our society a better place.